The Espinosa Maduro has become the first new blend in 2013 released by Espinosa Premium Cigars. Earlier this year, details of this forthcoming release started to come out about this release. When Espinosa Cigars was formed, founder Erik Espinosa acquired the rights to the 601 and Murcielago lines from his former company EO Brands. While those brands already gave Espinosa some maduros, the Espinosa Maduro is the first maduro blended by Espinosa since the launch of his company. The Espinosa Maduro is finally starting to make its way to retailers. We recently have an opportunity to smoke this cigar. No doubt, this is one stellar release by Espinosa Cigars. The Espinosa Maduro is a cigar that is made from Erik Espinosa’s La Zona factory – located in Esteli, Nicaragua. The Espinosa Maduro is coming out of the line of cigars bearing the Espinosa name The other cigar was the Espinosa Habano – that was introduced in 2012. Without further adieu, let’s break down the Espinosa Maduro and see what this cigar brings to the table. The Espinosa Maduro uses a Mexican wrapper. When Erik Espinosa was with EO Brands, he introduced the Murcielago – which is a maduro that also used a Mexican wrapper. A lot of people considered that cigar groundbreaking in terms of putting what a Mexican wrapper can do in the spotlight. As mentioned, the Murcielago came over to Espinosa Premium Cigars from EO Brands. The Espinosa Maduro provides a second – and different option with the Mexican wrapper. 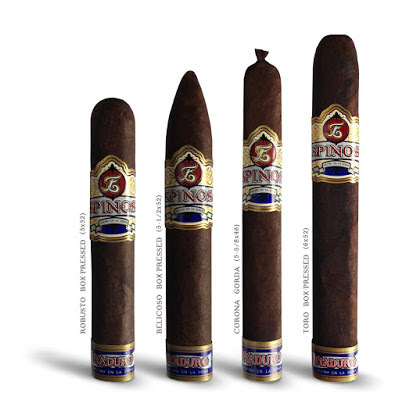 Like the Espinosa Habano, the Espinosa Maduro was launched in four frontmarks. The sizes of the Espinosa Maduro are not the same as the Espinosa Habano. Another difference is that three of the four vitolas of the Maduro are box-pressed. The only difference is the Corona Gorda – which is a rounded cigar. The box-pressed cigars all have a 52 ring gauge. All four sizes are sold in boxes of 20. For this cigar experience, I smoked the Espinosa Maduro in the toro size. The Espinosa Maduro has a nice chocolate colored wrapper. The wrapper also has a nice oily sheen to it. There are some visible veins and visible wrapper seams on the wrapper. The cigar itself is also a nicely packed box-press – not spongy and not too tight. There are two bands on the Espinosa Maduro. The primary band is the same as the Espinosa Habano band. It has a pale yellow, gold, light blue, dark blue, white, and red in its color scheme. In the middle of the band is a large light blue ribbon. On that ribbon is the text “ESPINOSA” in red font with black trim. Below that text is “HECHO EN LA ZONA” in a smaller black-colored font that is situated on a smaller blue ribbon. Toward the top of the band is a letter that appears to be a combination of an E and Z (white color with gold and black trim) on a red background. There are red stripes going around the back of the band with gold pinstripes. The remainder of the band has gold and black adornments. The second band is a footer band. This differs from the Espinosa Habano band. It has a dark blue, red, gold and white color scheme. The background is dark blue. The text “MADURO” is in red font with blue trim on a white stripe background sitting on the dark blue. Below that text, it says “HECHO EN LA ZONA” in think white font. The band has gold trim with a thin blue pinstripe. There is also some gold adornment around the band. For my smoke of the Espinosa Maduro Toro, I went with a straight cut to remove the cap. After clipping the cap, I moved on to the pre-light draw. The dry draw provided a nice mix of chocolate, leather, floral sweet/spice, and some background coffee notes. Overall, I considered the pre-light draw to be excellent on this cigar. At this point, I was ready to remove the footer band, light up the cigar, and see what the cigar experience would have in store. The start to the Espinosa Maduro provided a moderate, but not overpowering shot of pepper. As the pepper subsided, it was joined by leather notes and some secondary chocolate notes. As the Espinosa Maduro moved through the first half, the leather and spice notes remained primary while the chocolate notes were secondary. The spice seemed to have a multidimensional quality to it as I also picked up some floral spice notes in addition to the classic pepper notes. The chocolate notes also seemed present on the after-draw, but also increased on the tongue as I smoked through the first half. As for the retro-hale, it had more of a classic black pepper quality to it. As the cigar moved into the second half, the chocolate notes joined the spice as primary notes. The leather notes had transitioned to more of a classic nut flavor. The nut flavors were more of a secondary flavor in the early part of the second half. As the Espinosa Maduro reached the final third, the nut flavors joined the spice – which had transformed back to more of a black pepper spice. The chocolate notes once again receded to the background while earth notes also emerged in the background. While there was some spice at the end of the cigar experience, I found the close to the cigar experience had a smoothness to it. The resulting nub was outstanding – firm to the touch and cool in temperature. The construction to the Espinosa Maduro was outstanding and this was reflected in the burn and draw. Both the burn and draw scored very well on this cigar. The burn line did not take much maintenance to burn straight on this cigar. The resulting ash was a salt and pepper color with no major flaking. The burn rate and burn temperature were both ideal. The draw was outstanding to the Espinosa Maduro. Like the burn it did not take much maintenance and this resulted in a very enjoyable smoke. From a strength perspective, I found this cigar to actually have a little more kick than one might think. I assessed this cigar to have just enough strength to full into the medium to full area of the strength spectrum. As for the flavors, there is some nice depth to them. I assessed the cigar as also being medium to full in terms of body. The Espinosa Maduro does an excellent job in terms of balancing strength and flavor. Neither the attribute overshadows the other. One criticism I’ve had of Mexican Maduro wrappers is that they can be pungent and they can overwhelm the other flavors. Over the past year, I’ve found many examples of cigrs where if the blend is done right, this can become a non-factor in the cigar experience. The Espinosa Maduro is one such cigar that falls into that category. This is a cigar that has a very good flavor profile. The overall cigar experience just seems to click on all cylinders. This is an excellent cigar for the novice cigar enthusiast that wants to graduate to something medium to full in terms of strength and body. Experienced cigar enthusiasts who enjoy maduro cigars will be more than satisfied with this cigar. 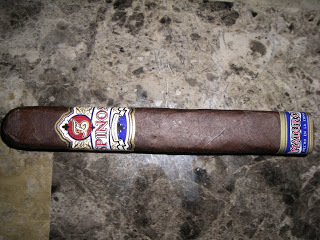 As for myself, this is an excellent maduro and one that I would put in my regular cigar rotation. Source: The cigars for this assessment were purchased from Smoke Inn Cigars in Boynton Beach, Florida. An additional cigar (in a Robusto size) was provided by Espinosa Cigars. Cigar Coop is appreciative for the sample, but in no way does this influence this review.